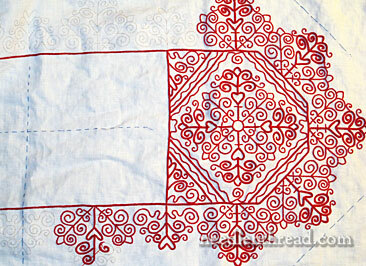 Hungarian Redwork Runner: Slow Progress… & Mind Games! I haven’t abandoned the Hungarian Redwork Runner – it’s just been a while since I’ve had a chance to pick it up and do much with it! 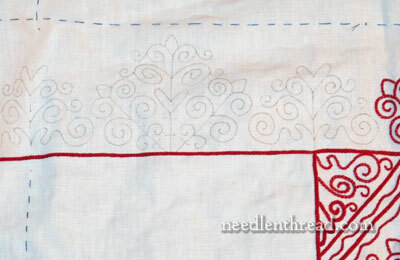 This embroidery project, worked from this embroidery design, is my grab-and-go, 15-minute project for right now. Now, by a “15-minute project” I don’t really mean it will only take 15 minutes to complete. (If only…!) Instead, I mean it’s a project perfect for 15 minutes here, 15 minutes there. This is also a perfect embroidery project to take along if I’m traveling or if I’ll be stuck waiting somewhere. It’s relatively compact, requires few supplies and no instructions, no hoop, and no extra tools. The whole project fits into a zipper bag, along with a tiny needlebook, a couple skeins of embroidery thread, and a little pair of scissors in a sheath. Because it’s so easily stowed – simple to take out and put away quickly – it also works well as a 15 Minute project. You can read a little more about my 15 Minute stitching philosophy here, but in a nutshell, it’s the idea that, even if you only have 15 minutes a day – between events or appointments, early in the morning before the rest of the house is up or before you have to leave for work, later in the evening when you just want a few minutes to unwind – if you devote those 15 minutes to your project, you’ll make progress. Ok, admittedly, it won’t be fast progress, but some progress is better than no progress. And you’d be surprised how 15 minutes here and there adds up on an embroidery project! This entire miniature Cluny tapestry project was worked on that notion. With just little snatches of time, it was – eventually! – finished. The funny thing (ok, not funny – rather pathetic, really!) is that I thought I had finished one whole side up to the halfway mark on the Hungarian runner, and I thought I was working on the other side, towards the halfway mark. The halfway mark is the basted line (in blue thread) on the far left of the photo above. When I took the project out again to devote 15 minutes to it the other day, I experienced that little jolt of reality – and disappointment – when I saw that I wasn’t quite as far along as I (inaccurately) remembered. … two and a half completely untouched motifs on the opposite side. But, some progress is always better than no progress! If I say that to myself over and over again, I’m pretty sure I can convince myself to be satisfied with the slow progress on this cloth! In the meantime, I’ll start treating it like a carrot. Yes, it’s true, I have a lot of weird approaches – call them mind games, if you will! – to embroidery. And one that works well for motivation is treating embroidery like a carrot. I give it to myself as a reward. “If I get such-n-such done in this amount of time, I will take 15 minutes to work on that.” It works!! Not only do I accomplish the tasks I’m supposed to accomplish but that are not very pleasant (you know, important things – like finishing taxes! ), but I also get a little reward at the end. Hey – whatever works, right? What about you? Do you play these little motivational games with yourself when working on embroidery projects, or when you have something you really want to do while the things you really have to do are hanging over your head? 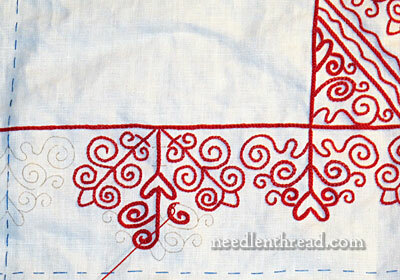 Do you work on your embroidery in snatches of time? Or are you a Whole Chunk of Time person, who has to work on needlework in large chunks at one time? Have you tried working on certain embroidery projects in short snatches of time, and found that it works, or that it doesn’t work? Do you have a Time Philosophy or a motivational approach, when it comes to your daily tasks and needlework (or anything else, for that matter)? I’d love to hear how others approach time, motivation, and needlework! Any thoughts? Leave your comment below! One thing I dare not do, is start stitching when I need to be out the door to somewhere, unless I have a timer. Everytime I come in here, I feel like doing more embroidery. I wait for your blog post everyday. Absolutely, I do play the games: do this and you’ll get a reward. Right now I’m trying to finish a quilt (I have 2 more to finish as well). I promise myself if I spend one hour on the quilt, then I’m allowed to go back to my regular needlework. Sometimes I’ll convince myself that I’ve worked very hard the past few hours and I need a rest. 🙂 So I’ll do a 15 minute stitching R & R. After 7 pm, anything goes. That’s my cut off point for all things practical (laundry, shopping, cleaning the litter box) and I’m free to stitch, watch TV or work a puzzle. Go away world. I’m busy. I have the same approach to projects that I have to reading. So much of what we want to do with precious time off has to really grab your attention and if I feel I’m losing the interest in a project I bag it up and put it away. I always find I go back to it, usually because I want to work on a different technique, or because I’ve finished something else and still have a yearn to stitch. We put too much pressure on our hobbies and interests, to be perfect, to have neat undersides, to be completed in a specific time. I find it serves me better, nourishes me, to let things take their own course. Whatever interested me enough to start a project inevitably draws me back to complete it….. And I get the joy and pleasure, without any additional stress. Yes, games to help get a task done. I have a running list of projects written in a little notebook in my sewing room. When a project is done, it gets crossed off the list. Often, I try to get things done and off the list to clear up the piles. Then things can get cleared, cleaned, tidied up, sorted, and projects that will never be finished gotten rid of. The reward – starting a new project! Good morning Mary. In the evenings, I have a cat named Bear who is getting older & has begun to insist he get to sleep on my lap for awhile after a little time out on the Catio. I usually work on lap frames & both won’t work at once. So I have a small project, currently, a set of Angel cross-stitch coasters I recd for Christmas that stays in my project box by my evening chair that I can work on above Bear sleeping in my lap. I do a lot of different projects on your ’15 minute’ suggestion, usually having 4-5 going at once. It really does work! Thanks for sharing your experience with us all. Absolutely, Mary…I play those games! Wow…I am glad that I am not the only one! Thanks for sharing your 15 minute project ideas as I like the “little” time investment and doing it more frequently. I have a tendency to want to set aside an hour or so (after doing laundry or house cleaning or whatever) and sometimes the hour gets stolen away by some other “to do” item. I like the 15 minute idea…and I will try it starting today…um…maybe right now! I agree that any progress is good and any day when I can spend a few minutes with my needle and thread in my hand is a good day. I am not good with filling in little gaps of time and adding a couple of stitches or threads, but carve out afternoons or mornings of time. I usually hand stitch while I watch television to mark the time or else once I sit down to do it, I lose track of time and just keep stitching–usually with a comment that goes something like–“I’ll just do this one more set of stitches to round out that end,” or “oh there is only 8 or ten more stitches in this color left, I might as well finish them up before quitting” and pretty soon I have stitched all afternoon and do not have the laundry folded or the dishes done, but have enjoyed a beautiful day. I’ve been known to stitch through the day and forget appointments and have had to learn not to start stitching if I have to go to work because I lose track of time. I just get so immersed in what I am doing that I just shut out the world. Less carrots please!!! I have a whole ROOM that I love and I can see my embroidery pieces and swear to them I will get to them again. My protestations fall on deaf ears as the residents of my sewing room sulk and hide on me. It takes more time than 15 minutes to set up again. (if everything is to remain dust free and tidy). They seem to sense that I am looking for something else or just looking and out of the blue an item will fall, it’s as if they are vying for positions. “I will not be bullied” I tell them. Makes no difference .They are relentless with their glares even though I do have legitimate reasons. Carpel Tunnel, arthritis and a need to work for wages. Love never enters their vocabulary. Its just….. me, me, me. In my defence though, I have changed my ways ‘somewhat’. I am slowly finishing many of the small items. Still, when I sit in the room doing these little jobs I feel that I am being watched and there are small arguments going on as to who is next and you can bet as sure as grubs eat apples something will move or fall. What is it? Bad stacking? or a little reminder they are still there. So my dear Mary I hope your carrots do not get too be as many as mine, as they sure can make life a living hell. I have a paper based todo list, otherwise I would be lost amongst all the smaller bigger tasks I need to do. Occasionally I add myself a “todo” that is actually something entertaining or fun to do. It’s the bonus to do from the list, and It’s a waited moment for me to be able to get it… it’s only a game with myself while working. My motivation is usually after the school run, I tell myself if I get these jobs done before lunch then afterwards I can stitch for an hour before picking the kids up. Amazing how fast you can whizz around doing housework or shopping! Yep. Motivational techniques to allocate time to hobbies is in full swing over here. I do have a grab and go bag that seems to get more time than any other projects these days. Looks like these next few years are filled with time waiting in the car or in offices. I actually look forward to that time now because I can do needlework and get some minutes of work done. This approach seems to allow a focus on smaller projects that are not very complicated and can be worked on while, ummm, (gasp) talking to others. All the planned Christmas projects were completed due to this strategy. So thanks for the words of wisdom Mary. Have always used motivational techniques to keep me moving on a project. The most effective one for me is to say “When I finish this, this and this, I get to stitch, although this ends up being usally in mid- to late afternoon. But it works, and the projects do get done. Except, except….that I find I am procrastinating big time on one big project right now. There has to be a way…. Previous Previous post: To Pin or Not to Pin: Why I Use Pinterest & Love It!